Monday night, straight to the gym from work. I was going to do a warm up cycle 15-20 minutes, but when I went in all of the bikes were taken, so it was on the treadmill for me again. I ran 2 miles in about 17 mins and warmed up nicely doing it. RUN: 2M, 17:10, 8:35, 250 calories. Ave HR: 143 (75%), Max HR: 154 (81%). 262 mile challenge: 59.45 – 2 = 57.45 miles to go. Then it was onto weights again. My abs were a little sore from Saturday, so I decided I’d replace the abs circuit with the next set from the 100 press ups app. Press ups – 72: 12, 17, 13, 13, 17. I tried to lift as heavy as I could, and did ok I think. 🙂 About 300 cals burned in about 45 mins. 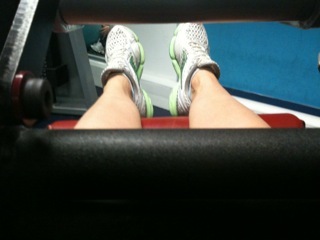 This entry was posted in Run, Weights and tagged 2, gym, machines, miles, run, snow, steady, treadmill, warm up, weights. Bookmark the permalink.